With 2016’s Machias Savings Bank Waterfront Concert Series being heavy on country music, fans will get a bit of all brands of county this summer, but only one living legend is on the list: Dolly Parton. Starting back in the days of Saturday night at the Grand Old Opry, Parton’s performance this Saturday night at Darling’s Waterfront Pavilion proved that she is only getting better with time. Dolly Parton is a national treasure. Parton’s 2016 tour is titled Pure and Simple, and living up to the name the stage was sparse and the special effects were lean. But who needs a fancy light show when you have Dolly center stage? Dolly Parton is her own light show. 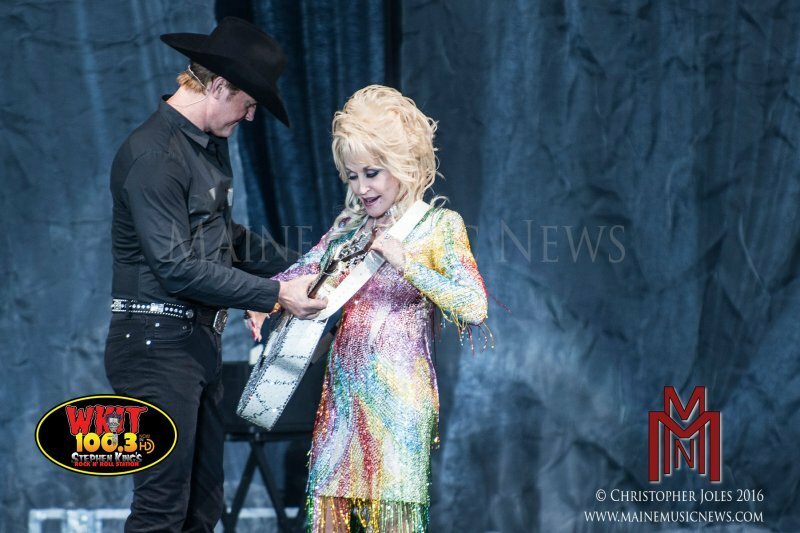 Wearing a heavily sequined and fringed rainbow dress for the opening set, Parton started the show with her version of Blackfoot’s “Train, Train” and covered several of her classics, including “Jolene” and “Coat of Many Colors.” Her voice is still flawless and powerful, perfect in every single aspect. The years have not touched her ability to sing like an angel. Dolly moved through the show with countless stories, jokes, her famous one-liners, gracious appreciation for the fans, and various instrument changes. And of course, all her instruments white and glistening with sparkles galore. Coming back after a twenty minute intermission, Parton wore another gorgeous sequined gown, and hit the stage with her hit, “Baby, I’m Burning,” before slowing everything down for several songs including an updated version of “The Grass is Blue” and songs featuring the harmonies of her longtime band mates: “Those Memories of You” and “Do I Ever Cross Your Mind?” Her lonesome, nearly a cappella offering of “Little Sparrow” cut through the night, stunning to watch and to hear. This was a goose bump highlight of the show. She wrapped up the show with her big hits, “Here You Come Again,” “Islands in the Stream,” “9 to 5,” and “I Will Always Love You,” much to the delight of fans. Like everyone in attendance, I anticipated a wonderful performance from Dolly, but I walked away feeling simultaneously uplifted and grounded. Her humor, her love of family, and her memories are just what the nation needs to hear right now. Dolly is a legend for so many reasons – truly a wonderful entertainer and beautiful vocalist – and she is also a light keeper reminding us to love one another, be true to ourselves, to dream big, and never give up.